We are floored with the beautiful, eye-catching paintings our little artists have sent with so much love and enthusiasm. 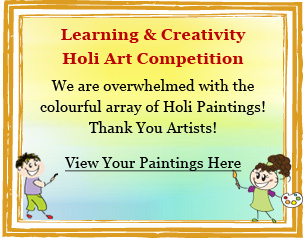 Learning and Creativity Holi Art Competition has announced its winners! Go ahead and check out which paintings scored over the others to emerge winners! Holi is an especially popular holiday in Lansing. The Bharatiya Temple hosts the area’s most prominent Holi festivities. Budding editor-writer and booklover Nitish Pahwa writes about how joyous a festival it is for Lansing, Michigan's residents. Holi is the time of celebration and festivities and one aroma that is closely associated with Holi is of puran poli being prepared in homes. So here we bring a quick holi recipe for making puran poli. Learning And Creativity brings you a selection of some great Holi scenes woven around this colourful festival. The chemicals used in the colors during Holi can wreck havoc on your skin and hair. Here are a few tips that can help you ensure a safer Holi.